Of all the ingredients I have ever cooked with, nothing is as commonplace yet as awe-inspiring as the egg. Quick to prepare and equally good in both savoury and sweet dishes, it can transform from a thick fluid to a firm solid, or just as comfortably to a fluffy foam. The way the clear white sets to an opaque colour is a wonder to behold, as is its contrast to the creamy golden yolk, which can change into a powdery sphere. It is the basis of custards and souffles, and useful in glazes and sauces, but the egg is not just a delicious accompaniment to any meal. It is a perfectly satisfying dish in its own right. In Western breakfasts, you can have it poached, scrambled, boiled or fried. In Chinese cuisine, you will see it steamed or preserved (think century eggs and salted eggs), or flavoured by steeping in tea. You can even consume it raw, though more commonly with something else, for instance on steak tartare or bibimbap, or drink it in a cocktail. 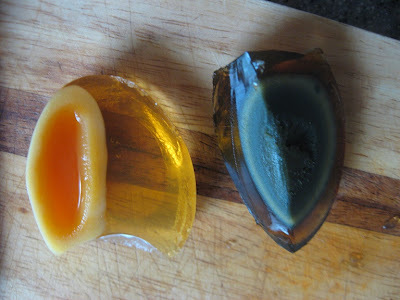 Two types of Chinese preserved eggs from D.H. Supermarket: 無鉛松花皮蛋/无铅松花皮蛋 (wú qiān sōng huā pí​ dàn, "unleaded preserved egg", left) and normal century egg, or 皮蛋 (pí​ dàn, right). Ajitsuke tamago, or "seasoned egg", are the eggs that are often served on ramen. Various bloggers have also called them ramen eggs, molten eggs, or lava eggs. The whites are firm, with a brown colour on the outside from being soaked in a soy bath, and the yolk is just beginning to set (at least this is the case with all the ones I have eaten, though there are many pictures online showing them with a slightly runny centre). These are the most raved about eggs, because the first time you eat a proper one (which for me was actually in Hong Kong), the colour, flavour and texture just blows you away. I could never go back to hard boiled eggs again, except maybe in a sandwich or salad. The eggs are normally served neatly sliced in half lengthwise, but not in the case of this tsukemen specialist, where we bit into whole eggs. Hanjuku tamago, or "half-cooked egg", are pretty much the same as ajitsuke tamago, except they are not necessarily seasoned. Hanjuku tamago on a simple bowl of ramen. Some dictionaries translate the term as "soft boiled eggs", but I've had soft boiled eggs in Singapore and Malaysia before, at those toast places where you serve them with soy sauce and white pepper. Those eggs had runny yolks, and whites that were just coloured. You could easily turn the whole thing into a puddle by stirring it. As you can see, hanjuku eggs are not that soft. For those who don't have the time or will to cook these at home, the convenience store also sells these eggs with perfect, translucent, orange centres! Hanjuku egg from the local Seven-Eleven. Not bad for a supermarket egg. Literally "hot spring egg", onsen eggs are cooked in their shell for a long time at a low temperature, so the white is the texture of a delicate, soft custard, while the yolk is beginning to firm. Like a nature-given sous vide, I suppose, if you are actually making them in a hot pool. This very soft boiled egg is a little less cooked than I expected. Raw eggs aren't new to me, of course. But I included this because the first time we had a raw egg in Japan, it was a tiny quail egg served on soba. The delicate yolk sat above what looked like egg white with a very strange texture indeed. Soba with sweet tofu and what I thought was a very strange egg. It was slimy, with solid white bits in between the sticky gloop. Did the egg react with the broth somehow? I wondered. I tried reproducing it at home, but all I got was your usual poached egg. I tried googling "lumpy egg white", "japanese raw egg", "raw egg on soba", you name it. I ended up finding about a Japanese breakfast dish of raw egg stirred through rice, called tamago kake gohan (卵かけご飯, "egg sauce over rice"), but nothing about the strange texture of our egg white. I asked several Japanese friends, who had no idea what I was on about. Finally, I sent the picture below through to an acquaintance. Close-up of the "lumpy egg white". The reason I couldn't find anything about it was because it wasn't egg at all! The white bits were actually a root vegetable known as yamaimo (山芋, "mountain potato)", which includes many varieties of tuber. Also called Chinese yam, it is used as the binding agent for okonomiyaki pancakes. In grated form mixed with dashi (出汁), the way we had it, it is known as tororo (とろろ). If you've ever had nattō (納豆, fermented soybeans), the texture of the grated yam was a bit like that. The black color is caused by hydrogen sulfide which reacts with iron from the hot spring to form iron sulfide which is deposited on the egg shell. This reaction does not occur in the hot spring due the low pH, but occurs on the egg shell which is primarily calcium carbonate. When left in the air the iron (II) sulfide is oxidized by oxygen in the air to iron (III) oxide. The sulfur ends up as either elemental sulfur or sulfur dioxide. Unfortunately the pools at Ōwakudani have rather hot water (80°C) and they leave the eggs there for an hour, so they are well and truly cooked. To me, they tasted no different from a normal hard-boiled egg. To help sales along, the enterprising shopkeepers not only include a little packet of salt in your paper bag (you can buy no fewer than five eggs at a time), but also claim that eating one of these eggs will extend your life by 7 years, eating two by 14! The black eggs were, sadly, hard boiled. On this trip, we came across the Japanese bento box staple of tamagoyaki, meaning "grilled egg", in the form of sushi. Sometimes laid on top of rice, and sometimes just served as a block alongside other sushi, this neatly sliced omelette cake was generally soft and slightly sweet, and served cold. Sushi with o-toro (fatty tuna belly) and tamago (egg). If you are a perfectionist, it can take a long time to learn to make your tamagoyaki just right, even if you own a special rectangular pan for the purpose. At Jiro Ono's three-Michelin starred restaurant, an apprentice had to make it 200 times before his omelette gained the chef's approval. We were in Japan for less that two weeks, so we didn't have time to eat everything we wanted to. We didn't manage to sample omurice (オムライス omu-raisu), a modern Japanese invention using an omelette to wrap fried rice. Nor did we have a steamed savoury egg custard known as chawanmushi (茶碗蒸し), literally "tea bowl steam", i.e. "steamed in a tea cup". Fortunately, fine renditions of both of these are available in Auckland, for instance at Restaurant Morita. I suspected your unusual egg white would be yamaimo! Next time you can intentionally order it by looking for yamakake soba. :3 I love the slimy, grainy texture! Thanks for the heads-up. Maybe we will have learnt enough written Japanese to be able to look for it next time.